Folding Teak Chairs from Westminster Teak are built to last over 75 years outdoors and untreated. Each chair is precision engineered to ensure long lasting durability in even the harshest of conditions. Guaranteed never to warp, rot or wobble for Life. 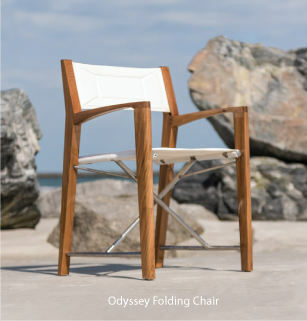 All of our folding teak chairs are suitable for indoor, outdoor, residential, commercial and marine use. We felt like we were taking a gamble ordering teak outdoor furniture on line, from a company we had never heard of...we are pleasantly surprised with the entire process. Your web site and customer response have been excellent, and our teak dining table is really very nice, good strong design and quality. We had almost gone with one of your competitors, but decided to give this a try and save several hundred dollars for what appears to me, to be a very simialar quality and design. We are doing some shopping for teak folding chairs and may be back soon for additional pieces.